NEW YORK -- Reducing energy costs on a daily basis can help consumers and small business owners save thousands of dollars each year. Energy bills can easily add up, of course, but in addition to finding cheaper rates online for electricity, heat or air conditioning, there are some other nimble ways to slash costs. First of all, determine if your city qualifies for deregulated electricity or natural gas. A lower rate can result in savings quickly, especially during months of higher usage of air conditioning or heating. Determine the pricing structures and if the local utility company offers any incentives. Many electricity companies offer discounts when power is used during off-peak hours. "Understanding how you pay for energy gives you the ability to develop and implement strategies for things like peak pricing, points in time that can make or break an energy management program," said John Rajchert, president of Honeywell Building Solutions, the Morristown, New Jersey, technology and manufacturing company. Robust energy management is about striking a balance between what a household or business needs and what's most effective for comfort and operational effectiveness. "Start off by taking an inventory of the equipment used in the office or building, and figure out the baseline of performance during various times throughout the day," Raichert said. This centers on doing a simple energy audit-- whether by yourself or with an outside contractor or consultant. "Improving energy efficiency is all about determining how to manage a building's [or house's] base load and making adjustments when grid-wide energy use and costs peak," he said. "It's not one or the other. With this insight, you can ensure your building is only using the amount of power necessary at specific times, helping to squeeze out as much energy savings as possible." Consolidated Edison, for example, offers lower rates on weekends, holidays and weekdays from 10 p.m. to 10 a.m. Planning accordingly -- for when demand and costs are low -- can help garner savings. It's possible for a homeowner to save some $30 a month with this strategy -- $360 annually. Consider replacing your current light bulbs with LEDs since lighting remains a "significant portion of electricity usage," said Alexander Goldstein, CEO of Eligo Energy, an energy retailer based in Chicago which provides electricity to residential and commercial customers in deregulated states. Another plus is that LED bulbs are up to 10 times as efficient and last up to 50 times longer compared to incandescent bulbs. To boot, they are better for the environment compared to florescent or CFL bulbs. In fact, given that lighting can total 5 to 10 precent of household energy costs, the average consumer can save $75 to $200 annually by switching over to more efficient bulbs. Those older model computer monitors or televisions that have the cathode ray tubes, or CRTs, should also be replaced with the newer liquid crystal-display, or LCD, screens, because they use less power. At home or in your business, examine your current servers for your data and consider "consolidating multiple older servers into new more efficient hardware" or simply using the cloud, he said. Servers are large consumers of power and also emit heat, requiring additional air conditioning to keep them at a very low temperature constantly. If you haven't swapped them already, power switches with motion sensors are a good method to reduce the use of electricity when a room is empty. The lights will automatically turn off when inhabitants or employees leave for an extended period, making the task of saving power relatively easy. Some older homes and offices still have their original thermostats. Opt for a programmable thermostat, because you can program temperatures for peak hours of business or use, Goldstein says. With a smart thermostat, consumers can save 30 percent on their home's heating and cooling bills. The amount of electricity being used in a home or office is substantial, said Ernest Freeman, vice president of engineering in Hartford Steam Boiler's Loss Control Engineering Group, a Hartford, Connecticut-based equipment breakdown insurance company. Leaving on various appliances "not only draws power, but also generates heat that can contribute to higher cooling bills," he said. Using tools that can automatically shut down appliances such as coffee makers, water coolers, vending machines and registers can lower the amount of vampire loads. Devices that are plugged in, but shut off, are still using electricity. A better option is to plug equipment in the office into power strips. A smart power strip is a good investment, because it "senses when a product is not in use and eliminates its standby power consumption," Freeman said in a blog post. For homeowners and business owners who want to invest in long-term infrastructure, installing solar panels could yield additional savings. 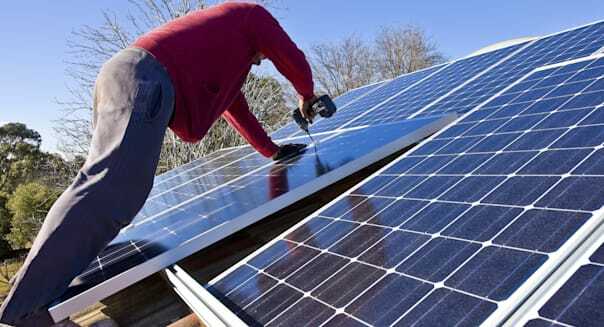 A lower reliance on the power grid is a benefit and companies can either lease or buy panels. Although the solar panels are expensive to install at first, the savings range from six to eight times over 25 years, the duration of most panels, said Jim Nelson, CEO of Solar3D, the Santa Barbara, California, company that produces technology for solar cells.